What should I do if the payment can't be confirmed for a long time? 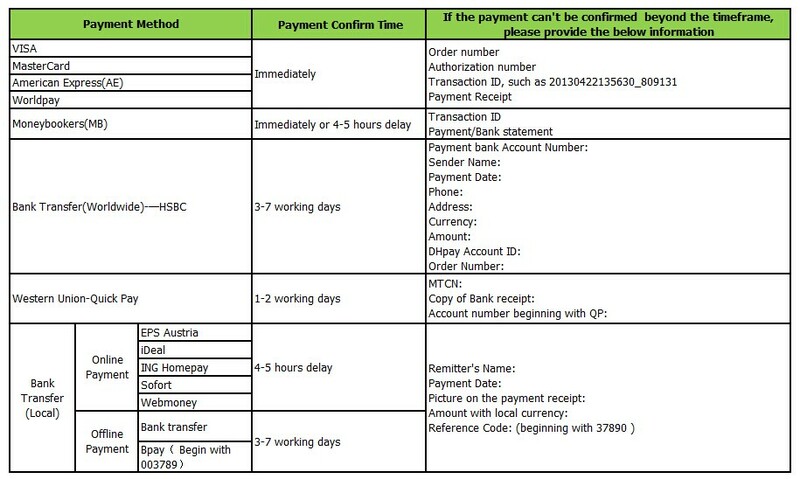 Payment confirmation date varies with different payment methods. If payment hasn’t been confirmed within the specified timeframes below, kindly send us the?REQUIREDinformation so our Payment team can verify. What credit card issues can DHgate help to resolve? NGY Customer Service can help you to verify that you have entered your payment information correctly for your order. However as mentioned above, most credit card payments rejections are due to reasons related to your card issuing bank and therefore outside the control of DHgate.
? Contact your bank about payment security policies. Your bank may flag any unexpected activity on your account. This includes first time orders and high value purchases, regardless of the amount of funds you have available or your credit limit. Your bank may require your verbal authorization to proceed with a transaction.
? Contact your bank about daily withdrawal or purchase limits. Most banks have limits on how much money can be charged or accessed in a single day. If you exceed this daily amount, your bank may block your account from any further activity regardless of the available funds in your account. Your bank may require you to request a higher purchase limit to complete a transaction.
? Contact your bank about payment authorizations, reserved funds and charges. When you place an order with DHgate, we contact your card's issuing bank to confirm that your credit card has a valid number, and has not been reported as lost or stolen. This is communicated via a full authorization procedure for the amount of your purchase.
? Verify the payment information entered on your order. Did your billing address change recently or did you get a new card with a new expiration date? If you have previously used a payment method successfully on your account, you may simply need to update your card and billing address information. If you entered a new payment method, make sure you have entered all card number and other information correctly.
? Submit an alternate payment method for your order. If you are unable to resolve the payment issue with your bank in a timely manner, you are always welcome to change the payment method on your order to another card or payment type. Please contact DHgate’s Customer Service to inquire about what other payment methods are available on our platform.